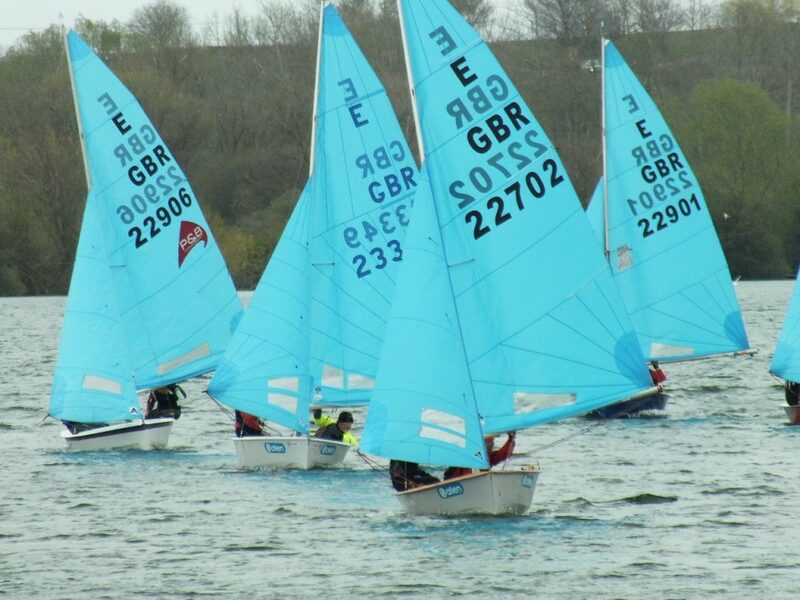 The cream of the Enterprise fleet including visitors from as far as Scotland kicked off the first event of the Sailing Chandlery Enterprise National Circuit at Middle Nene Sailing Club on 6th & 7th April 2019, held in a North Easterly force three wind giving some excellent racing. 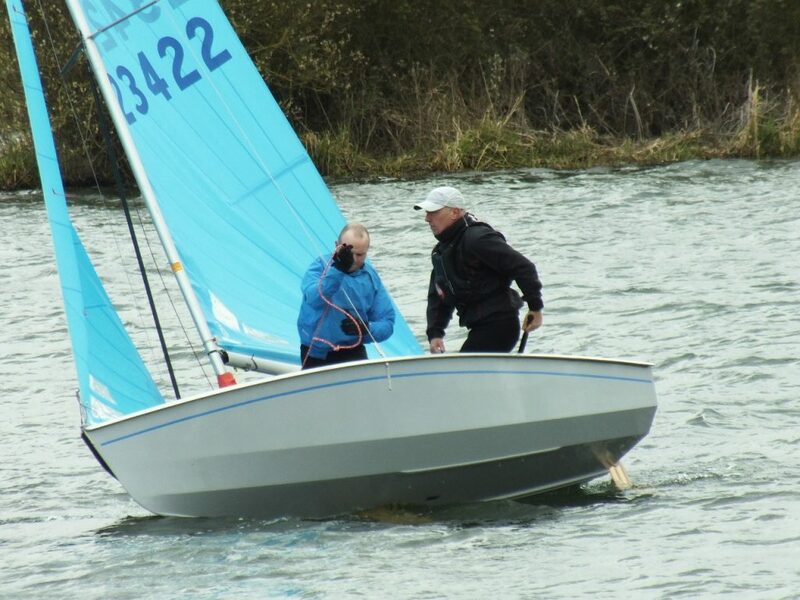 Emerging from their long hibernation Nigel Bird sailing with his wife Andy and yet to apply a flyaway jib stick to his mast, lulled the fleet into a false sense of security by languishing towards the back of the fleet in the first race. New pairing Tim Sadler and Chris Keatley (Yorkshire Dales / Penarth) romped home to a comfortable first place in this one with local hero’s Jane and Nick Scutt in second and Ann Jackson and Alan Skeens (Burghfield SC) in third. After the lunch break the second race started. This time Nigel and Andy tacked off the Starboard end of the line into an unassailable lead which they held to the finish, Tim and Chris worked their way through the fleet to chase down Nigel and Andy but never made it finishing second. Jane and Nick finished third. 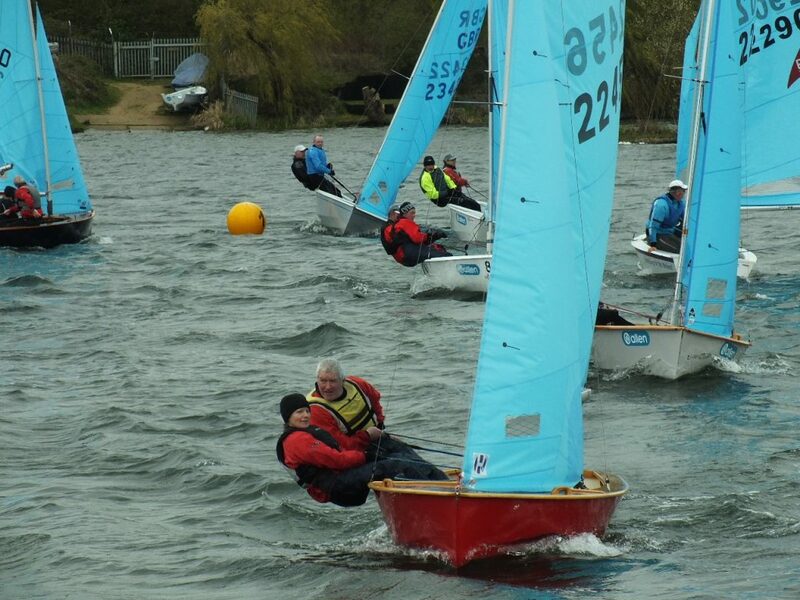 The third race was sailed back to back; Nigel was heard to say that Tim was very lucky and that when he gets his new jib stick “Tim is toast”. Nigel and Andy and Tim and Chris had a lead swapping race for first and second around all three laps. Nigel and Andy had much of the lead for the early part of the race whilst Tim and Chris were finding their feet, but their downwind speed was superior and they ultimately prevailed. Ann and Alan finished third again. The fleet returned to the clubhouse to join the local club members for their “fitting out supper” an excellent three course meal which everyone enjoyed. The fleet returned to start the fourth race at 10.30am on Sunday morning with a few sore heads. The wind was a little lighter however once again from the North East blowing straight down the lake. Paul Young crewed by Aimee Allsopp (Midland SC) showed a rare moment of brilliance tacking onto to port soon after the start and going right to lead at the first windward mark. Second were Ges Brown crewed by Chris Blundell with Nigel and Andy third. Ges and Chris passed Paul and Aimee on the second reach but lost out to Nigel and Andy on the run. This time they once again extended their lead to finish first, winning their second race of the weekend. Ges and Chris and Tim and Chris had a battle for second and third place on the last lap until Ges and Chris misjudged the finish line and hit the finish line buoy resulting in a DSQ. Tim and Chris finished second with Ann and Alan third again. With the championship nicely balanced and giving all to play for, going into the last race Tim tried his legendry team racing type manoeuvres to stop the Bird’s winning the last race. Tim started the pre start manoeuvres as the aggressor and obviously crossed the start line last behind Nigel and Andy. At the front of the fleet Jane and Nick stormed up the beat to lead at the windward mark with Ges and Chris in second with Simon Childs crewed by Kato Greer (Middle Nene SC) in third. On the run Nigel and Andy plus Tim and Chris finally caught up the leaders. At a crowded leeward mark Nigel unfortunately dropped the tiller hitting the mark. Jane and Nick then held the lead until the final run when they succumbed to the pressure from behind just short of the last mark when both Ges and Chris and also Tim and Chris both got past. This time Ges made no mistakes on the finish line winning this race from Tim and Chris in second, and Jane and Nick in third. Winning helm Tim Sadler thanked everyone involved at Middle Nene Sailing Club who gave up their time to give the fleet a great weekend. 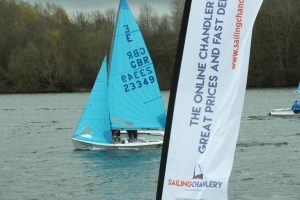 The Sailing Chandlery Enterprise National Circuit continues with the Inland Championship at Bristol Corinthian YC on 27th/28th April, to which we all look forward to. For further details please see the Enterprise Class Association website.